When you look back on 2019, what will you have accomplished? What contributions will you have made to achieve your company’s hiring plan and improve your ability to recruit talent in the future? For Recruitment Marketing to advance as a discipline, we must bring more discipline to Recruitment Marketing. 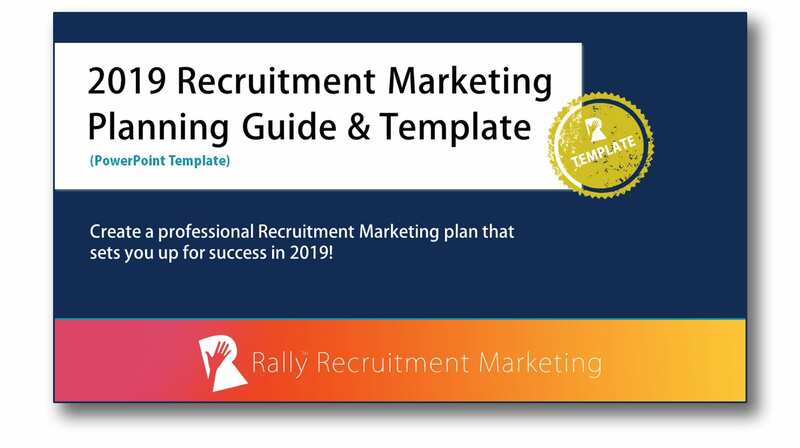 That’s where the Rally™ 2019 Recruitment Marketing Planning Guide and Template comes in! Whatever your role in Recruitment Marketing, Employer Branding, Talent Acquisition, Human Resources or Marketing, this guide will provide you with a blueprint to create a professional Recruitment Marketing plan for 2019 that will set you up for success. Yours to customize, available in PowerPoint and PDF. Sponsored by Glassdoor and Talemetry. Goals – what specifically and measurably will you deliver on in 2019? Programs – which programs will you implement to support your goals? Projects – what projects will you lead that will impact 2019 and beyond? Resources – what resources will you require internally and externally to be successful? Technology – which tools and technologies will enable your success? Reporting – how will you track, measure and report on your outcomes? Glassdoor and Talemetry are sponsors of Rally. Their sponsorship fee helps us to create educational content and events on Recruitment Marketing.